Happy December everyone! Can anyone believe that we're nearing the end of 2013? Because I sure can't! 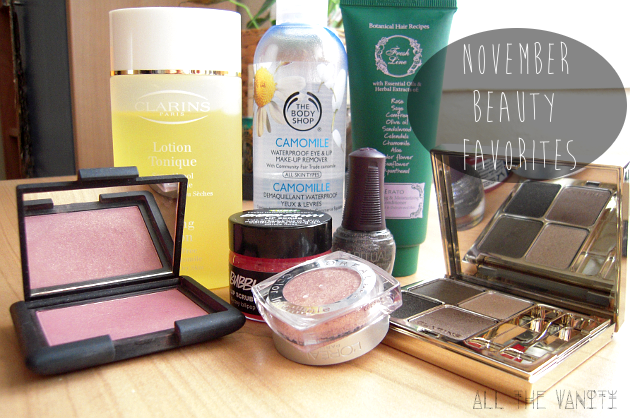 Regardless, we just put November behind us, so you know what that means: time to share with you my beauty favorites for the month! 1. Clarins Toning Lotion With Camomile. I've recently added this alcohol-free lotion to my nighttime routine, and I must say, I was very impressed by it: it completes the cleansing process without any irritation, if anything it has a soothing effect, a quality which I rate very high, and which lasts even after I apply my serum and moisturiser. If you're looking for a gentle toner, I'd highly recommend this! 2. The Body Shop Camomile Waterproof Eye & Lip Make-Up Remover. Lovely product, that proved to be extremely effective for removing my everyday eye makeup this month (see 6). Full review here. 3. Fresh Line Erato Repairing & Moisturising Conditioner. I've already mentioned this numerous times already, so it comes as no surprise that it made this list! Deliciously smelling hair conditioner that softens and adds moisture to dry and processed hair like my own, thanks to its numerous herbal extracts, such as rose, sage, olive oil, calendula, camomile and so on. 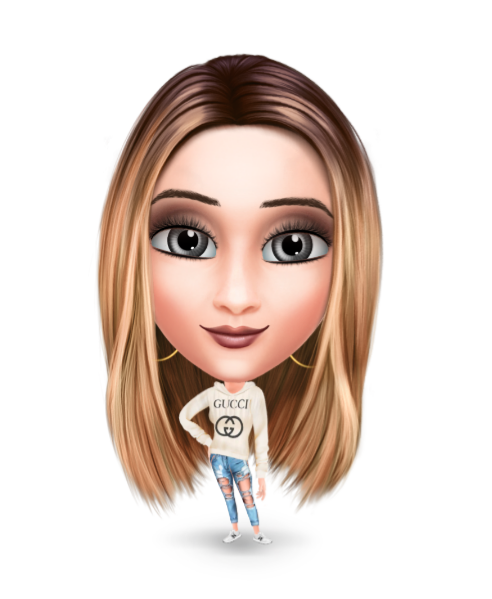 Its texture is slightly on the thicker side, almost half way between a hair conditioner and a mask, so those with oilier hair may wish to look for something lighter. 4. NARS Sin blush. 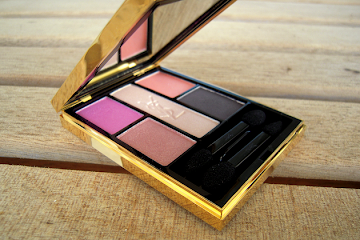 One of NARS's bestsellers, Sin is a gorgeous mauve-meets-berry shade, infused with gold shimmer. It definitely deserves its "cult status" as a fall/winter staple! Beware though if you're as pale as me: use with a light hand (swatch below)! 5. LUSH Bubblegum Lip Scrub. 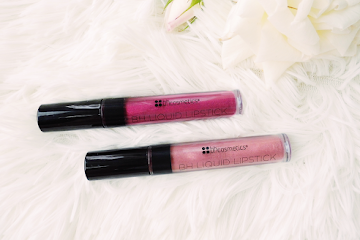 A product that divides the beauty community like no other is definitely a favorite in my book! And while, I do agree that you can get the same result with a diy version, this is easy to use and travel with and it won't leave an oily residue behind (as I suspect some diy versions do). Handy little lip exfoliator this one, it's already in the "to be repurchased" category! 6. L'Oreal Color Infaillible Eyeshadow in 004 Forever Pink. A metallic rosy pink shade with a very flattering peach toned sheen to it, it complimented my fall makeup look perfectly! Bit of a pain to remove though, which is where my TBS eye makeup remover proved its worth (swatch below)! 7. 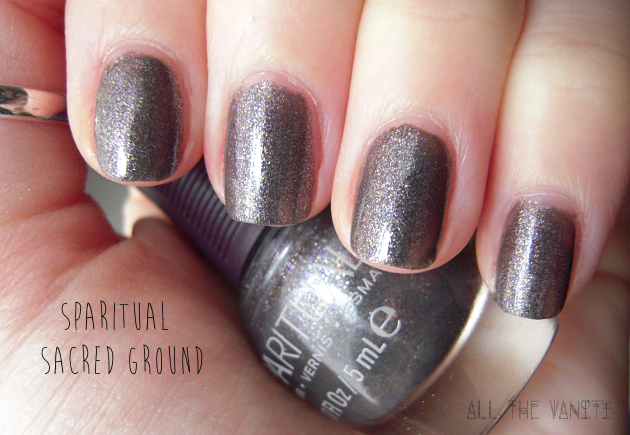 Sparitual Nail Lacquer in Sacred Ground. Sparitual is a vegan nail polish brand, and, Sacred Ground is one of their best-known shades: gold and purple shimmer (that leans more blue during the day and more pink during the night) in a gunmetal grey base. Really unique shade that merges the autumnal (aka dark) with a more glam element (swatch below)! Aaand, that was it! Another one bites the dust!!! The nars blush and the l'oreal eyeshadow found their way into my Wishlist! The nailpolish gorgeous as well, where do you buy sparitual from? Ζήλεψα το Nars Sin που βρίσκεται εδώ και καρό στην wishlist μου!!!!!!!! Και το βερνίκι φαίνεται φανταστικό!!! 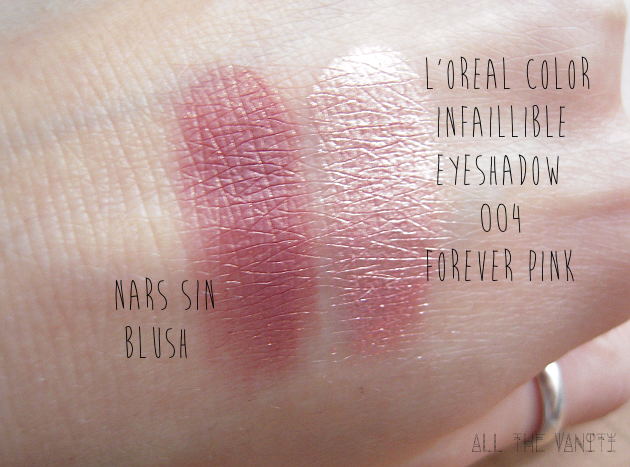 @Marina (Makeup4all): Sin is truly lovely, I know NARS blushes are hyped up in general, but this is worth it, for sure! As for Clarins toners, hehe, agreed! I'm using the Energizer one for mornings and the Camomile one for evenings! Great toners, both!